If the end of January is approaching then I know I can expect a variety of things: emails from sites I subscribe to sharing the perfect Super Bowl snacks, bloggers swapping their tried and true party dish faves, and people talking about whether they’re planning on a game day get together or not. None of it has been discussed in our house yet, because we’ve been busy, busy, busy with life enjoying a long weekend making like tourists in West Hollywood, soaking up the last bits of our youngest’s company before he returns to San Francisco for the spring semester, celebrating family birthdays and anniversaries, and in the past couple of days, nursing one of our cats back to health after a run in with a neighbor’s kitty. Goodness! And it’s not over yet. Any time now, my husband will ask about what’s on our Super Bowl agenda. It always seems to be a last minute sort of thing most years, and that’s just fine with me because it doesn’t take too much thought to decide which snacks football fans will expect to have at their fingertips whether they’re for our small family, or a larger group. I doubt there has ever been a time we haven’t had fresh salsa or pico de gallo with guacamole and tortilla chips. A pot of chili with all the fixin’s and a salad for halftime eats are also the norm even though the chili recipe varies from one year to the next. But I’m also known for sneaking in something that may raise eyebrows, causing certain guests to cast one another a nervous glance before pointing and asking, “What is that?” then politely suppressing the urge to continue with, “Do I have to eat it?” as they reel their fingers back in. Actually, they now ask, “How do I eat it?” because it seems my food often has rules that accompany it — or must seem like it does. Is it supposed to be dipped, or layered? Which of the ingredients on the plate create the best bite? Is it finger food, or do I need a plate and fork? To their credit, they seem much more enthusiastic than they did years ago, so I know my risks to encourage people to try something new haven’t failed, and that makes me happy. They’ve long accepted they will never see “taco pie” loaded into a corn chip bag with a plastic spoon sticking out of it coming from my kitchen because they figure it’s something the snack bar on the Little League field sold when they were kids. Once upon a while ago, they may have seen cheese sauce hot from the microwave ready to pour over their tortilla chips and call the mess nachos, (shhh…don’t tell anybody) but now, they get hummus or white bean and roasted garlic dip with toasted bread, crackers, or raw veggies and they like it. And sometimes, they get to bite into spicy grilled sausages, nestled into a crusty sandwich rolls smothered with grilled onions and peppers, then topped with mustard. That still counts as manly game day food, doesn’t it? I hope so, because if it doesn’t, then my football party days are over. Many of my close friends have been changing the way they eat for a variety of reasons. Losing weight always seems to be on everyone’s mind, but honestly, as we’ve gotten older, lowering cholesterol or blood pressure, controlling Type 2 Diabetes, and yes, even learning to tolerate food during and after cancer treatment have far outweighed the desire to lose a few pounds for the sake of simply looking better in our clothes. None of this has stopped us from enjoying the food we share when we get together because making sure it’s fresh and delicious is the ticket. 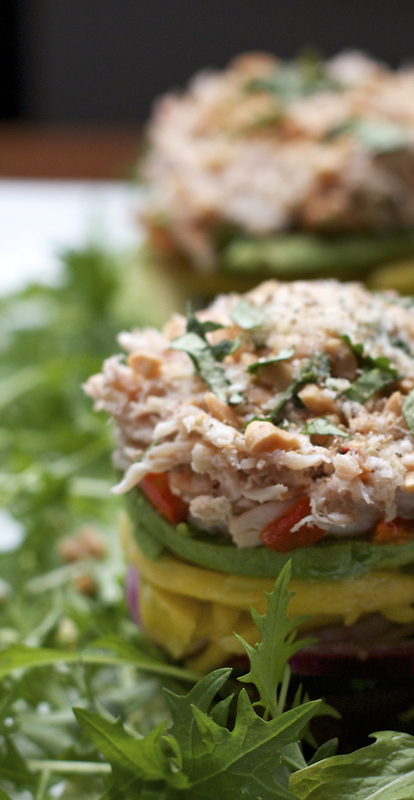 These crab stacks are the perfect party food. They’re light, bursting with flavor, easily adaptable to a variety of ingredient choices, can be made in advance, and most importantly, fit nicely into anyone’s healthy life style. I’ve been invited to Gojee’s virtual potluck and know people will enjoy it! Starting on Thursday, January 26, check out other potluck dishes fellow gojee contributors shared. Go to gojee.com and enter “gojeepotluck” into I Crave. You can also follow #gojeepotluck on Twitter. If you’ve never visited gojee, then you’re in for a treat. Prepare ginger-lime dressing by mixing ginger, agave nectar, lime juice, garlic, and water. Pour into a sealable container and refrigerate at least 1-2 hours and as much as over night. To assemble the crab stacks, you’ll need two cylinders such as dessert rings or recycled cans with the bottoms removed. Lightly spray the inside of the cylinders with cooking spray, then line two small dishes with pieces of plastic wrap large enough to pull up and over the cylinders (you’ll need to do this after you’ve built the stacks) and place the cylinders on top of each. Begin layering ingredients inside each of the cylinders in this order: pea shoots, tomatoes, cucumber, onion, mango, avocado, jalapeno, then finally, the crab. Gently press down on each ingredient as you fill to make sure it’s securely layered. If making ahead, pull the plastic wrap up over each and wrap, then place in the fridge until ready to serve. To serve, choose a large platter and place each cylinder on it. Unwrap and holding the cylinder with one hand, slide the plastic from beneath it. Then slowly lift the cylinder, pushing lightly on the ingredients to reveal the stack. Finish by sprinkling the chopped peanuts and cilantro over each stack, sprinkle baby salad greens around the platter if desired, and drizzle with the ginger-lime dressing. Allow everyone to admire the crab stacks before encouraging the first guest to dig in, scooping into the stack with crackers or toasted slices of bread. 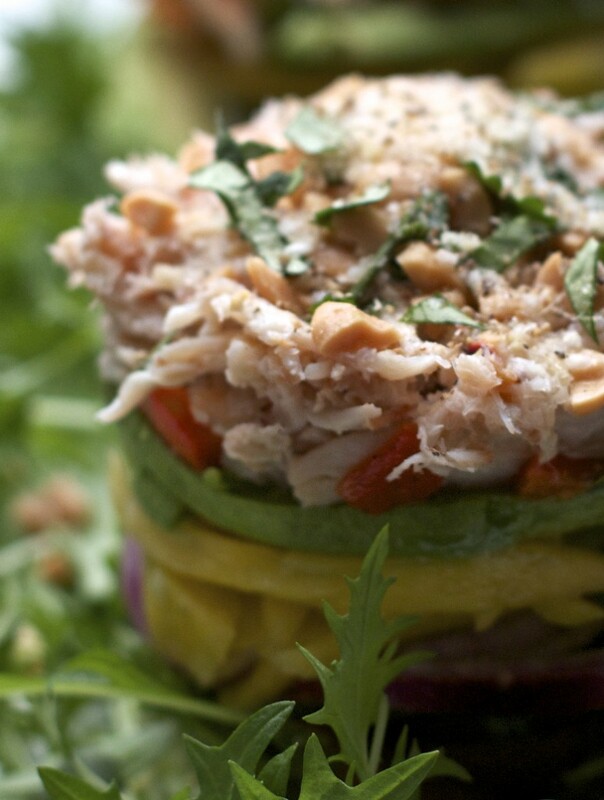 This recipe was adapted from Rappongi’s Chef Stephen Window’s Polynesian Crab Stack. Rappongi’s is one of our favorite San Diego restaurants. The original recipe calls for sugar instead of the agave nectar and double that quantity. I’m not fond of overly sweet salad dressing so prefer my adaptation more. It allows for the flavor of ingredients to stand out instead of the sugar in the dressing. Honey would be another good choice. I used canned crab meat for this recipe Blue Star. It comes chilled in a 1 lb. can and is much more than is needed for this recipe, so I wrap it up and freeze it for a later use. It’s pricey at about $16/lb. but when you consider all you can make with a pound, it’s worth it. Have some fun with the ingredients if those on the list above aren’t available to you. 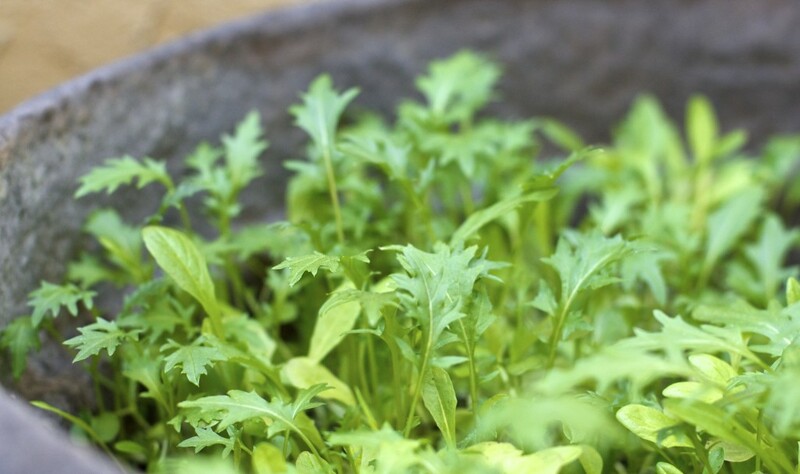 Pea shoots are available at Whole Foods and Sprouts, but you could use a different type of sprout instead, or leave them out all together. Colorful bell peppers, either diced raw, or roasted and cut into strips would be a nice option. Thinly sliced apple would also be delicious, grilled pineapple, or citrus such as blood orange slices, or grapefruit. If you don’t like crab, then try shrimp or tuna. The peanuts add a nice crunch to the mix so if you can’t use peanuts, then try toasted pine nuts. Even a sprinkle of toasted sesame seeds would add a nice touch. 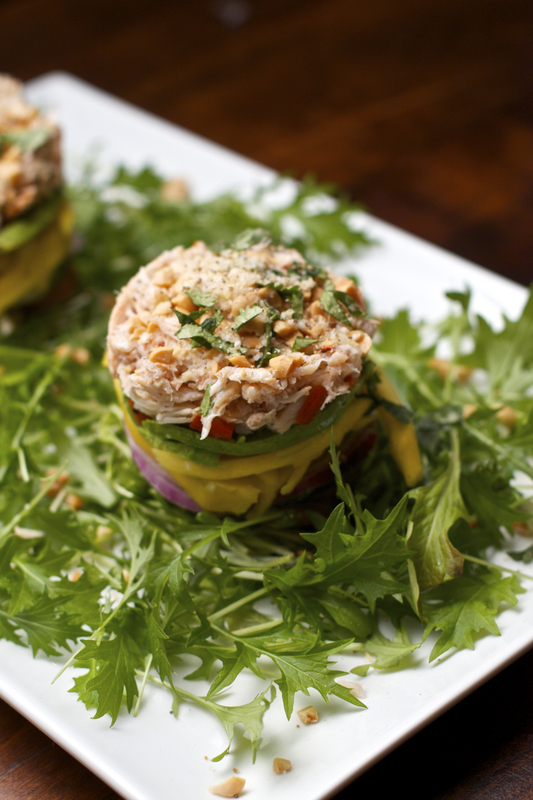 If you’re in the mood for a treat, just make one of these crab stacks for yourself and increase the amount of salad greens. It makes a beautiful, elegant lunch, or starter for a special dinner. Speaking of salad greens, that’s my first ever crop of salad greens I’ve grown. I have a pot just outside on my patio that barely gets enough sun in the winter, and so sprinkled the seeds over the soil my tomatoes are usually planted in. The tender crop has somehow managed to escape the attention of snails so has done really well! All in all, as much as it is interesting to do this, we eat so much salad, there’s no way one pot could ever keep up with us. Still, I’m proud of my first effort!